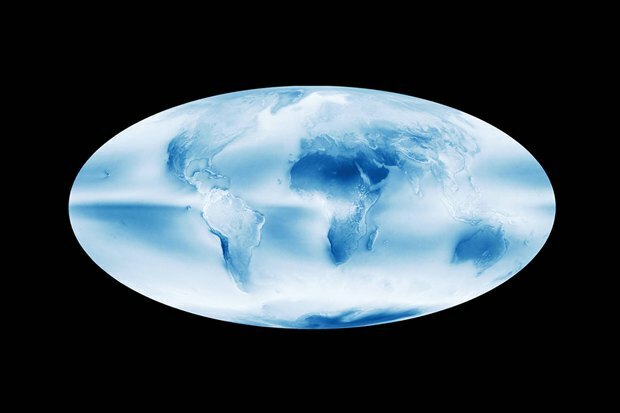 This image released by NASA shows an accumulative view of the Earth taken from the Aqua satellite which has been monitoring global cloud cover since 2002. The darker, blue areas are cloud-free while the white areas represent the most cloud cover. The image shows a white band (suggesting overcast areas) around the equator and two bands parallel but higher north and lower south. These are areas where warm air is pushed up, becoming moisture at it rises and cools. The dark areas over the Sahara desert, the Arabian peninsula, South Africa and Australia represent clear skies, which can be explained by falling air, rather than rising air. Many scientists are concerned that climate change is thinning cloud cover, which is vital in protecting us from the sun. If the Earth didn't have clouds to reflect sunlight, the sun would "otherwise bake our planet and obliterate life."